Variable Barrier Over Five Feet Tall? Yes We Can! 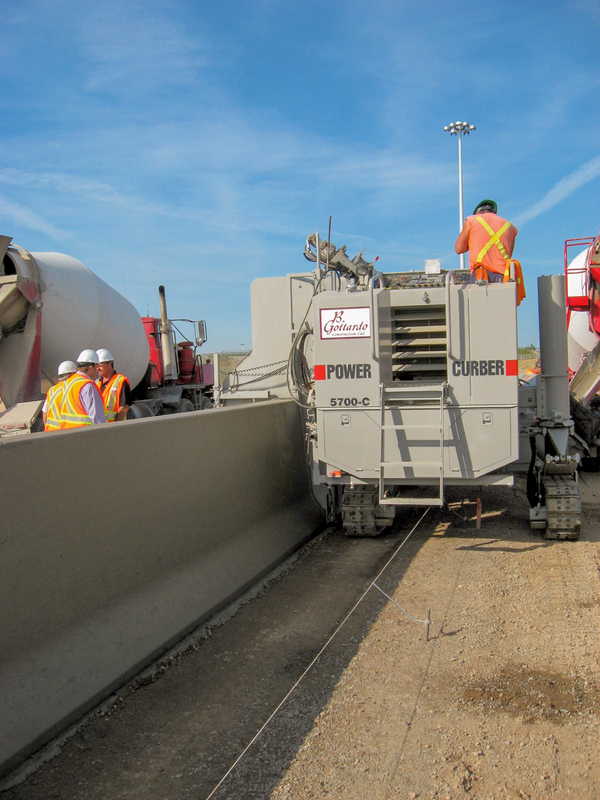 When B. Gottardo Construction, Ltd. of Woodbridge, Ontario, Canada landed the $42 million, 5-mile long (8.5km) Highway 410 Extension project along Toronto’s western suburbs, they found themselves with several major challenges. Four bridges, environmentally sensitive areas, and super-elevations which required a monster barrier wall gave them plenty to do. The barrier, though only 44”(110cm) tall in its basic configuration, stretched to 68”(170cm) high and called for 24”(60cm) of variability in the most severe super-elevations. Faced with such a wall, Gottardo set out to find the best machine to match their requirements. 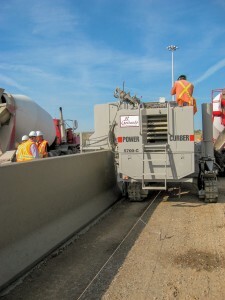 Delivered in early summer 2009, the 5700-C poured the wall throughout the summer and completed it in late September. A typical start-up, it took a few days to get the concrete mix and delivery perfected and some minor tweaks were made to the mold. 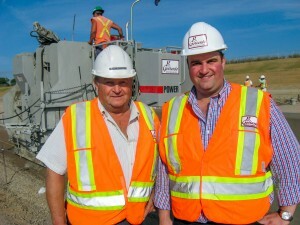 “We got up and running in just a few days. We’re happy with the machine. Our operator is happy. Once we got the mix dry enough, everything came out just perfect, very smooth” states General Manager David Gottardo. 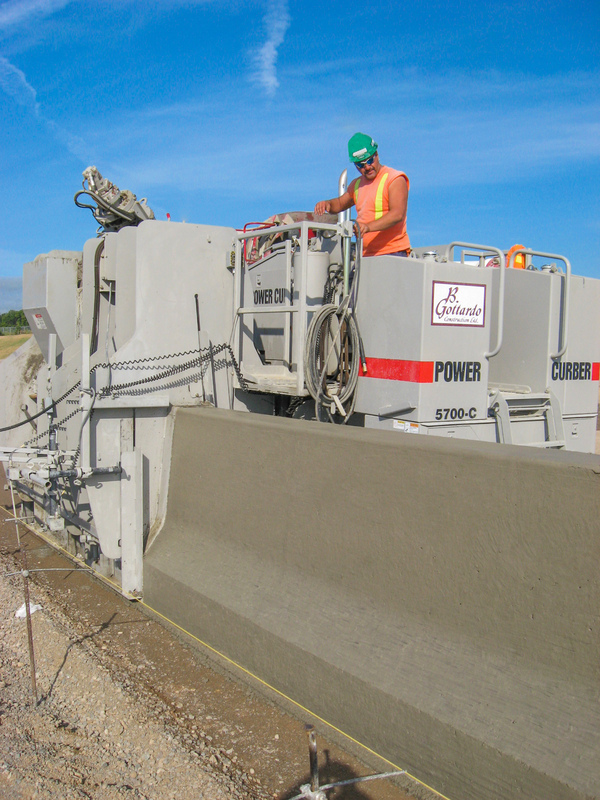 Due to the size of the wall and complexity of the project, the Gottardo 5700-C is equipped with optional all-crawler steering, digital networked controls, and counterweights. The massive, bifurcated mold weighs 9,800 lbs (4,445kg) and its variable sides have 24” (60cm) of adjustment. Although steel was not used in the barrier, the mold was built with an open front to allow for future projects. Also unique to the job was the use of dual stringline control. One stringline placed in the typical position outside the wall was used to control steering and elevation. A second stringline was then set between the tracks. Using sensors mounted underneath the machine, Gottardo used the second line to control the right side of the mold. With this dual setup, the mold was able to maintain a constant wall height and vary the right side up to 24” in the super-elevations. Highway 410 is a major artery along Toronto’s busy west side, shuttling thousands of commuters daily. Gottardo’s Hwy 410 Extension will stretch the road an additional 5 miles (8km) north, connecting travelers to the city’s northern reaches. Gottardo has complete responsibility for the four-lane stretch and will see it to completion from land-clearing to signage. In addition to the road and barrier, four bridges and interchanges make up the project. Bruno Gottardo, a native of Italy, founded B Gottardo Construction Ltd. in 1970 and concentrated on earthmoving in the early years. Today, Bruno says Gottardo and its 250 employees focus on “road building from A to Z.” Bruno primarily oversees day to day operations while his son, David, and daughter, Lianne, handle the management and administration of the company.